September 2016 • SMT Magazine 91 DEFECT FEATURES DETECTED BY ACOUSTIC EMISSION achieved 6 . 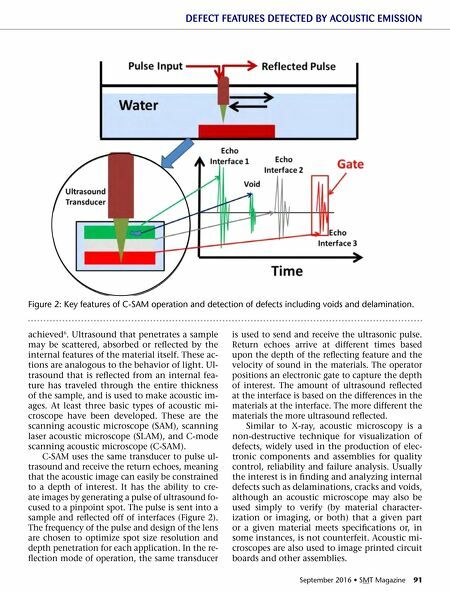 Ultrasound that penetrates a sample may be scattered, absorbed or reflected by the internal features of the material itself. These ac- tions are analogous to the behavior of light. Ul- trasound that is reflected from an internal fea- ture has traveled through the entire thickness of the sample, and is used to make acoustic im- ages. At least three basic types of acoustic mi- croscope have been developed. These are the scanning acoustic microscope (SAM), scanning laser acoustic microscope (SLAM), and C-mode scanning acoustic microscope (C-SAM). C-SAM uses the same transducer to pulse ul- trasound and receive the return echoes, meaning that the acoustic image can easily be constrained to a depth of interest. It has the ability to cre- ate images by generating a pulse of ultrasound fo- cused to a pinpoint spot. 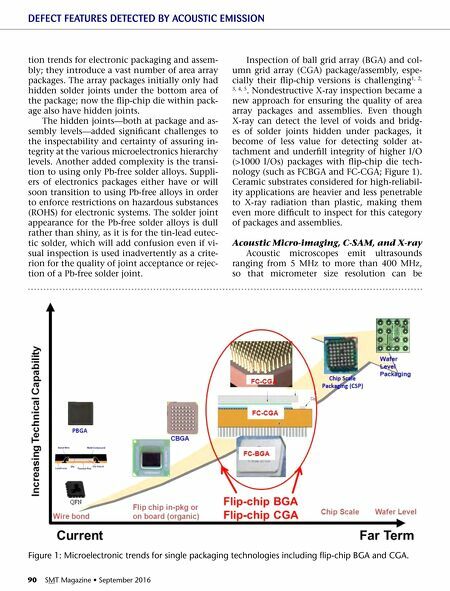 The pulse is sent into a sample and reflected off of interfaces (Figure 2). The frequency of the pulse and design of the lens are chosen to optimize spot size resolution and depth penetration for each application. In the re- flection mode of operation, the same transducer is used to send and receive the ultrasonic pulse. Return echoes arrive at different times based upon the depth of the reflecting feature and the velocity of sound in the materials. The operator positions an electronic gate to capture the depth of interest. The amount of ultrasound reflected at the interface is based on the differences in the materials at the interface. The more different the materials the more ultrasound reflected. Similar to X-ray, acoustic microscopy is a non-destructive technique for visualization of defects, widely used in the production of elec- tronic components and assemblies for quality control, reliability and failure analysis. Usually the interest is in finding and analyzing internal defects such as delaminations, cracks and voids, although an acoustic microscope may also be used simply to verify (by material character- ization or imaging, or both) that a given part or a given material meets specifications or, in some instances, is not counterfeit. Acoustic mi- croscopes are also used to image printed circuit boards and other assemblies. Figure 2: Key features of C-SAM operation and detection of defects including voids and delamination.